In today’s society emails are used as a way of communicating messages. But you must be sure that you know that the person you are sending the email to reads their emails on a regular basis. Working with Doctors Nurses and other Healthcare professionals over the years has proved that this sometimes email is not the best way to pass a message on. I have worked with Doctors that simply do not check their emails and of course some messages will be meant for a team rather than an individual – such as District Nurses or Health Visitors. Your practice might have a counsellor or a physiotherapist that only comes in once a week and they might not have access to a computer. Some of our Reception staff was absolutely great on the desk – but not great on IT skills and a few unable to use email so all of this had to be taken into consideration when passing on messages. Your practice will have a procedure of passing on messages – ensure that you are fully aware of their protocol on message taking. The practice that I worked in had several ways of passing messages let me share some of these with you. And signature of person taking the message. Another Surgery that I worked in had a message pad instead of a book. 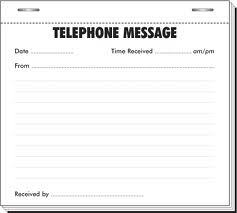 The message pad had carbon copies and they could tear off the message and a copy would be kept in the book. Its really how your Surgery best works. Signature of person taking the visit. date it when they had read it – it was their responsibility to read it every day. Memo’s from various departments were also added to this folder. All Reception and Admin staff had their own individual staff in trays – any individual message would be placed in their tray for them to read at the beginning of their shift. All other Healthcare professionals within the Practice all had in trays and messages would be left here and it was their responsibility to ensure that the messages were collected on a regular basis. Some of the various departments had message books like the Doctors and Receptionists – but these books were kept in their tray at all times. Here are some important tips on how you should take a message. ALWAYS write the message clearly – someone else has to read it. ALWAYS sign your name at the end of the message. With all messages if you think that the message is urgent always ensure that you pass it onto someone for immediate attention. Do not leave a urgent message in a book or a tray. Often you may take a message on a Monday and the person the message is meant for is not in for a few days – or could even be on holiday – without a date or time they have no way of knowing when the message was taken. A message could be used in a court of law. It would be classed as evidence. It would be proof that correct procedure was carried out – if the time, or date of the message is not included your Practice would not be able to relay on this evidence. It is important to sign the message – if the person who the message is for has a question then they know exactly who to speak to rather than having to speak to several members of staff get before getting the right person. Try not to put message on “stick it” pad as often they can get attached to another piece of correspondence and often turn up in completely the wrong place and often days or weeks later. person back yourself for some reason. And it is very important to store you message books or diaries away when they are full – your practice could need this information years after the entry if needed in a court of law. My website is about Depression and anxiety. Thank you – more to follow. Very nice, i learned very much and would like to read some more. Thank you very much for your comment. I’m just recovering from an operation at the moment so there will be more training to follow soon. You are very welcome – I’m pleased it help.